For Christmas one of the Staff at OSC gave me the Crooked Horn Bino System. As I went hunting this evening the Bino system came in handy for me as I didn't have to dig into my pack to find my binoculars I hand them right with me. One of the most useful systems a hunter could have. I highly recommend the Crooked Horn Bino System. 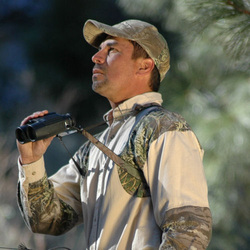 The Most Innovative Binocular Harness Ever Designed. Are your binoculars a pain in the neck? We have the solution! Introducing the Slide and Flex Bino-System designed to use your shoulders instead of your neck to support the weight of the binoculars.